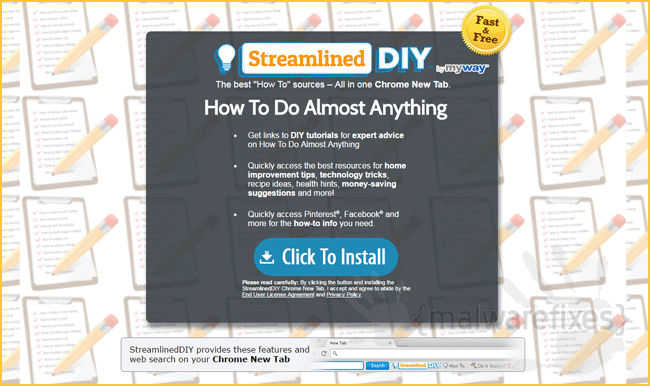 Streamlined DIY is a browser extension made specifically for Google Chrome browser. It claims to give user quick access to home improvement tips, technology tricks, recipes, money-saving suggestions, and many more via Chrome Tab. Upon installation, Streamlined DIY will change new tab and default search settings. The adware also adds some links on the home page and toolbar, which it state as useful. With thorough study, it was discovered that Streamlined DIY is the source of excessive advertisements and browser redirect. In fact, this adware originates from MyWay, known maker of several potentially unwanted programs. EasyWeatherAlert, DIY Toolbar, and Reading Fanatic are among its products. Streamlined DIY issues contextual ads in various formats. It may show pop-up ads, banners, in-line, redirects, or full-page endorsements. The safety of these ads is still in question. There are reports that malware authors are exploiting this ad campaign to distribute malware or adware. Thus, be cautious when clicking links delivered by Streamlined DIY extension. Removal of malicious program like Streamlined DIY may be complicated when done without proper tools and efficient scanners. Plug-ins, files, and registry entries are just some part of this adware that cannot come off right away during normal virus scan. Therefore, you are not fully removing Streamlined DIY through ordinary means. It may re-emerge once you restart the computer. In order to remove Streamlined DIY together with other adware that comes with it, we have provided a simple guide on this page. We recommend the use of various malware scanners to delete all hidden adware entities that were dropped on different location of your computer. 3. Look for and remove Streamlined DIY, MindSpark, or MyWay entry. If not present, look for any suspicious labels that was installed recently. 4. It searches for presence of harmful programs, plug-ins, add-ons, or any data that were found malicious and linked to Streamlined DIY. You need to Clean all items detected by this tool. After the previous scans, you may have deleted Streamlined DIY from the affected browser. This next step will ensure that no more module of adware will be left on the browser. This free tool scans and checks the browser for unwanted add-on and extension, and if found, Avast Browser Cleanup will give you a report and suggestion. 4. Avast Browser Cleanup will confirm before it permanently deletes the add-on. Please click Yes to proceed with the removal of Streamlined DIY on the affected browser. Cleaning your internet browser from clutter and unwanted add-on/extension is a must when dealing with Streamlined DIY. The procedure below discuss on resetting various browsers to its default state. Resetting Google Chrome to default settings is helpful in deleting hard-to-remove extension such as from Streamlined DIY. This method is highly advisable to perform if you have difficulty in removing unwanted extension. This function will reset your home page, new tab page, search engine, and other areas affected by Streamlined DIY. Unwanted extensions will also be removed from the browser. This will not affect your bookmarks, history, and other saved data. You may also run Chrome Cleanup function from this page. An integrated tool from Google Chrome but with more advanced Adware scanner feature. This section describes how to remove unwanted extension from Firefox that may be related to Streamlined DIY.. This process can fix many browser issues by restoring Firefox to factory settings without affecting your essential information (bookmarks, browsing history, passwords, and Internet cookies) on the browser. If you desire to remove only specific extension, please see manual removal of add-on from Firefox. 4. Firefox browser will close and start the resetting process. When done, it will display a list of restored data. Streamlined DIY should be gone by now. Click Finish to open a fresh version of Firefox. Your data like favorites, bookmark, and history will remain in the browser. However, this process may delete add-ons by Streamlined DIY and other unknown objects. If you prefer to carry out the procedure manually, please add-on removal from Internet Explorer.